IF you are into continental hopping, it is hard not to include Istanbul on your travels. Catch a Bosphorus ferry from downtown Eminonu to Sariyer near the entrance to the Black Sea and the ferry darts across the narrow waterway from Europe to Asia, back to Europe and then Asia again, several times on its one-hour journey. The Bosphorus is the strategic narrow waterway that links the Sea Of Marmara (and onto the Mediterranean Sea) to the Black Sea and all the Soviet seaports and markets surrounding the inland sea. Throughout history, whoever controlled this narrow stretch of water controlled regional trade. Turkey’s largest city and former capital has been through many changes throughout history — from being first known as Byzantium, then Constantinople and now, Istanbul. Various people have left their cultural imprints upon the people with the most obvious signs being the legacy of fine buildings, mosques, churches and castles. However, it is the blend of all things European and Asian that pervades most parts of Istanbul life from food to dance and lifestyle. Historic Istanbul : Istanbul is a lively city where mosques call people to pray five times a day and yet, young Turks can party well into the morning with club goers from around the world who come here especially in the summer months to be part of the vibrant city scene. Wherever visitors step in the Old City in central Istanbul on the European side, there’s evidence of the past in many areas. But, the Old City is also dissected by many elements of contemporary life but one gets the impression that the city’s future is very much guided by its past. With a population exceeding 15 million, Istanbul is one of the region’s largest cities and growing at a rapid rate. The ancient lanes and cobble-stoned streets of the Old City struggle to accommodate the people of Istanbul who are keen to keep pace with the rest of the world. While guidebooks romantically refer to the great historic sites, it’s the modern face of Istanbul that most tourists will encounter even when visiting the city’s historic sites. Istanbul has been a strategic city for some 2,000 years. The original settlement was around along the Bosphorus and the Sea Of Marmara but now there is a sea of houses sprawling well away from the water’s edge. The city has been home to great civilisations such as Byzantium, Constantinople and the Ottoman Empire. It was once part of the Roman Empire and in the 9th Century, the city had attained a population that exceeded one million. Ancient Architecture: Istanbul’s great architectural structures reflect the various historical periods and the religions and cultures that have controlled Istanbul. In the early 4th Century, Emperor Constantine established Christianity in Byzantium (as Istanbul was originally known). Several early Christian churches still remain in Istanbul with Aya Sophia (St Sophia) or Haghia Sophia being the main building of the period. Also known as the Church Of Holy Wisdom, it’s one of the city’s most spectacular sights and one of the world’s finest architectural creations. Always a building of continued political controversy, Aya Sophia stands out above the Istanbul horizon along with the equally stunning Blue Mosque in the area known as the Golden Horn. During the Ottoman period, Aya Sophia became a mosque, but today it is a museum that celebrates the Byzantium era. Certain quarters want to see the building revert to its original function as a mosque, while others want it to re-open as a church and, others want it to remain neutral ground and retain it as a museum. While the debate continues, all visitors can admire its architectural splendour. Even those who debate its function, agree that 56m high domed structure which took six years to build, is one of the finest buildings in the world. Aya Sophia was completed in 537 and was lit internally by a myriad of candles. 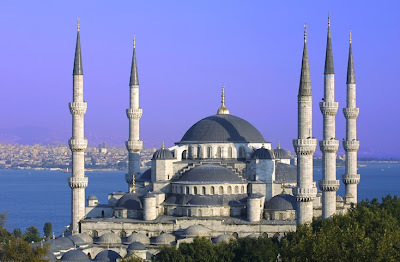 Not far away, perched on the highest piece of land, is the Sultan Ahmet 1 Camii, better known as the Blue Mosque. While quite an impressive building from the outside, it is the blue-tiled interior that captures attention. The mosque was built in the early 17th Century and its imposing architecture dominates the Golden Horn area. Around the corner is the entrance to the vast Topkapi Palace which was once the seat of the entire Ottoman Empire. A whole day could be spent here to appreciate its treasures, artwork, frescoes and, once secretive harem. At one time, the palace was a miniature town with some 50,000 people living and working here. Heady Maze : The Grand Bazaar is close by and shoppers will find that a day or so may not be enough time to see it all. It’s a maze of alleyways, cafés and shops with most outlets staffed by enthusiastic hawkers trying their hardest to lure shoppers. Bargaining is an important part of buying anything and don’t be worried about getting lost in the mayhem as someone will point you in the right direction after all the shopping fun. The Egyptian Spice Market situated closer to the waterfront is the place for fresh fruit, nuts, spices, rich Turkish coffee, cheeses and trays of tasty Turkish delight.